Girls Can Do – F.A.Q. 1. 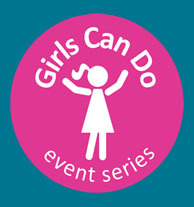 What is a Girls Can Do Ambassador? 2. How do I sign up to be an Ambassador? Go to the Ambassador Program page on our site and click the “Become an Ambassador” button. Our form will ask for your name and mailing address so we can send you your t-shirt, button and tickets. 3. Do I need to know how many girls I am bringing before I sign up as an Ambassador? No, If you don’t know how many girls you are bringing yet, no problem! Sign-up now to get started and then let us know by emailing ambassadors@girls-can-do.org when you have your numbers finalized, so we can reserve space at the event hall and send your free tickets ahead of time. 4. I am going to sign up as an Ambassador. Should I independently promote the event on local social media using the video and blog posts and then submit the form once I have a final count of girls I am bringing? Yes, but if you are thinking of covering a big area you might want to consider being a Volunteer Lead. A Lead gets other volunteers to help reach out to schools, community centers, churches, community groups, etc., within your community. They help get lots of Ambassadors to sign up, rather than you bringing a group on your own (it’s like creating a little army!). You will hopefully still bring some girls with you and also be an Ambassador yourself. 5. What are the requirements for reduced ticket prices? I don’t personally need a discount but I’m sure if I promote it to others someone will ask. Anyone can get a free ticket. If you sign up as an Ambassador on the site, tickets are automatically free. The price on the website is for people signing up on their own through word-of-mouth or some kind of promotion. The price is really only to create commitment for coming, as we have limited seating and want everyone who signs up to come. That is also why we put the Ambassador model in place, creating more accountability for coming and also making it more fun and less scary or overwhelming. 6. Is there more information about what the girls will learn/experience at the event? Is it mostly inspirational speakers or are there coding workshops, etc.? The day is a combination of inspirational women speakers who will talk about challenges they have overcome, how they built resilience, and their path to success. Between each speaker we have local girl organizations come on stage and talk about the programming they offer and also have some of their girls onstage as well. The day is intended to be a catalyst for change and for girls to see the world differently and leave the event believing that anything is possible. They will get this from the speakers, the local girl organizations, and most importantly from the other girls around them. It’s a real, in-person, physical experience. There are no workshops at the event, but girls may sign up with any of the local organizations in the lobby for a “next steps” action plan. 7. What ages are recommended for the event? Is it directed primarily at elementary age girls or is it for K -12? The event is for all ages really, but middle and high school girls are the main emphasis. We are most focused on bringing girls whose parents are not available to bring them and especially on girls with less opportunity from high needs areas. This is also why we are so focused on our Ambassador model, bringing women and girls together for a fun and inspirational day.